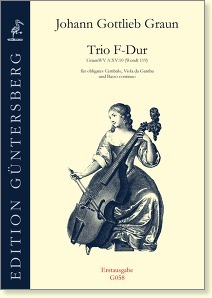 Editor: Günter and Leonore von Zadow, publication date: 2004-11, introduction: Michael O'Loghlin, continuo realisation: Angela Koppenwallner, source: RISM: D-B SA 3627 Trio F-Dur etc. 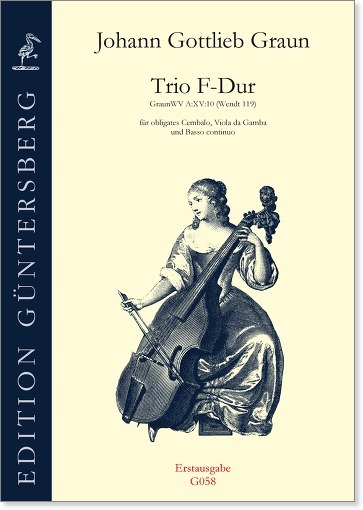 This is the first publication of one of the most interesting works ever written for the viola da gamba and harpsichord, and a highpoint in the gamba's late baroque repertoire. (See also Trio in C major, G042.) Here Graun has clearly had the specific characteristics of both gamba and harpsichord in mind, since the writing for both instruments is so idiomatic. In this Trio harpsichord and gamba are ideally accompanied by a continuo group consisting of a second harpsichord and a second gamba e.g. However, the Trio can also be played just by two, harpsichord and gamba. The part of the basso now also contains the figuring. To view and print please click here: G058C.